Myself and Cyburn were fortunate enough to once again get a chance to cover the UK’s premier gaming convention EGX. Among the many wonderful gaming professionals we had the pleasure of meeting on the con floor this year were Yacht Club Games, the geniuses behind the high anticipated Shovel Knight (which is coming soon to many formats, including the 3DS thankfully!). For those of you who haven’t heard of Shovel Knight ; it is a mediaeval platformer not entirely dissimilar to Capcom classic Ghouls & Ghosts. What sets Shovel Knight apart, however, is the fact our armour-cladden protagonist rocks a shovel instead of a sword, a detail that, awesomely, has many far reaching implications for the title’s gameplay. The team have kindly agreed to sit with us and answer some questions for 3DSBlessed readers. Enjoy! 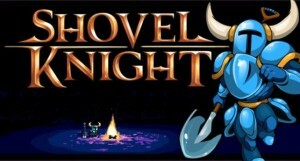 1) Where did the idea for Shovel Knight come from? Shovel Knight was born out of a desire to make a game based around a simple, single mechanic like the NES games we loved. We thought the downthrust from Zelda 2 would be a really cool attack to expand into an entire experience. With the downthrust, we discussed what other actions would fit well within that mechanic, and we kept coming back to a flipping or slashing mechanic. The only real weapon that could fit those two scenarios was a shovel, and from there, we landed on Shovel Knight as our protagonist! 2) What was behind the decision to make the graphics 8Bit in appearance? First, we had always wanted to create a game in an 8bit style. We had made a lot of retro revivals, but never had a chance to see what a game would be like if we were to create the original experience. Beyond that, we were a fledgling new company, and simple pixel art was something we could do in our wheelhouse for cheap! 3) What has your experiences with your former employer WayForward brought to this new project? At Wayforward we made a lot of 2D platformers that were inspired or based on 2D retro games: Contra 4, A Boy and His Blob, Double Dragon Neon, Batman, and more. We took the experience of building all those games, and figured out what worked and didn’t work to create the world and gameplay of Shovel Knight. 4) The game is dripping with delightful mediaeval references. Did the team do any research on the period to help facilitate this? And if so what? Absolutely, every time a character is created, we spend a lot of time looking into the histories of related time periods, clothing, stories, myths, events, attitudes, etc. For example, Plague Knight’s gear and personality comes from a lot of historical ideas of plague doctor’s during the time and fears and views associated with them. 5) How did you manage to get legendary MegaMan music composer Manami Matsumae to contribute to the soundtrack? Has this helped add to the Shovel Knight hypetrain? Mohammed Taher of Brave Wave got in contact with us during the beginning of our Kickstarter. He suggested that instead of him backing the project, he would get Manami to contribute a couple songs to the soundtrack. We thought Manami had retired, and didn’t believe his story for a second! But we couldn’t resist the temptation of having such a legend compose for our game, so we followed up the request, and it turned out he was telling the truth! It was a complete, humbling honour to work with someone so brilliant as Manami, and I think it definitely helped people understand and be excited for the game we were making. 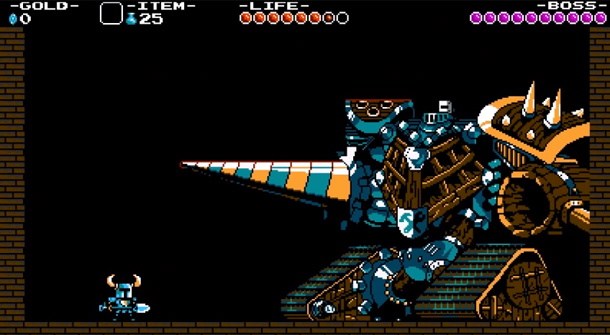 6) Speaking of hype, has Shovel Knight’s astounding popularity surprised you at all? We are surprised every second of the day that people love and connect with Shovel Knight. But at the same time, we did have some expectation that people would like it. We were longing for this kind of game ourselves, so we figured we couldn’t have been the only ones! 7) When we met in person you mentioned there is extensive DLC planned for Shovel Knight 3DS. Would you be able to recount these for our readers? Sure! We are planning 3 playable boss campaigns: Specter Knight, King Knight, and Plague Knight. Beyond those, we also have a challenge mode and a gender swap mode. And finally, the biggest of all, a 4 player battle mode with all knights playable! There’s a lot of content to come, so I hope everyone is excited and will keep having a ton of fun playing Shovel Knight. 8) 3DSBlessed reader Rob Staplehurst would like to know when Shovel Knight’s EU release date is. Is that something you’d be able to divulge to us? We would like to take this opportunity to thank Yacht Club Games for taking part in this interview. We loved trying Shovel Knight at EGX and, hence, simply can’t wait for it to arrive on eShop.